Hemangini Singh mimics the swirls and patterns in marble on her block-print scarf. Where do many designers get inspiration for their patterns? That's easy: They look outside. Inspired by the natural swirls in marble and limestone, textile artist Hemangini Singh creates her unique scarf. Each one-of-a-kind piece is made using a traditional resist dyeing and block-printing technique. 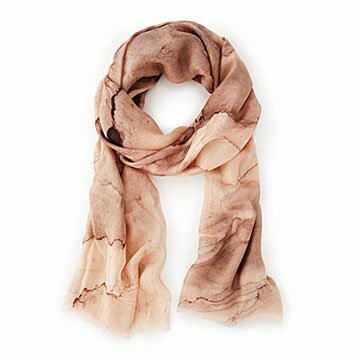 The result is an artfully designed, modern accessory that brings natural beauty to your wardrobe. Handmade in India. Textile artist Hemangini Singh draws her inspiration from iconic forms and local artisans. Her passion is experimenting with traditional resist dyeing and block-printing forms and techniques to make artfully designed contemporary accessories. These authentic textile crafts require meticulous design planning and precise color chemistry, yet result in the perfectly imperfect beauty she craves as an artist. Each piece is a unique expression of her East-meets-West aesthetic, blending traditional style with her own inspired refinement.